Can you even believe how carefully these little tomatoes are displayed? It would be nearly a shame to make a purchase, wouldn’t it? 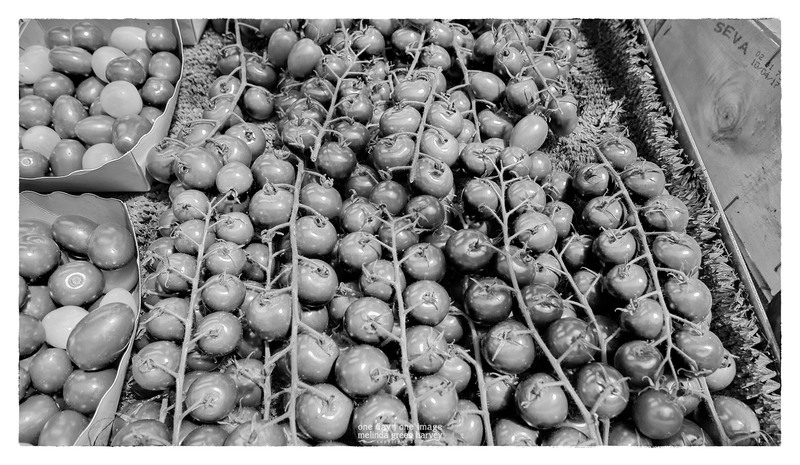 Posted on August 1, 2017, in Photography and tagged 365 photo project, black and white photography, France, learning to see, Leica, Marché des Enfants Rouges, market, melinda green harvey, monochrome, one day one image, Paris, photo a day, photography, postaday, thoughtful seeing, tomatoes. Bookmark the permalink. 3 Comments. It’d be nice if our own supermarkets took that sort of care. I’ve taken to carefully selecting fruits and vegetables, then asking Wendi if she wants to slam them around and get the pleasure of bruising our purchases or if we should let the cashier do it. Haven’t you found that it is much more satisfying to bruise your own purchases? Or is that just me?